No need to purchase costly wedding cards from market, save your money and use Wedding Card Designer software to make colorful wedding invitation card of your own choice. Marriage Card Maker Software designs wedding cards with solid color, gradient image and style setting feature. Wedding Card Generator software designs and prints multiple invitation cards for friends, relatives and for other people. Wedding Card Maker software provides advance featured image designing tool such as Line, Ellipse, Rectangle, Pencil, Arc, Triangle and Star objects. Wedding Card Designing software creates printable cards with flexible print setting feature. 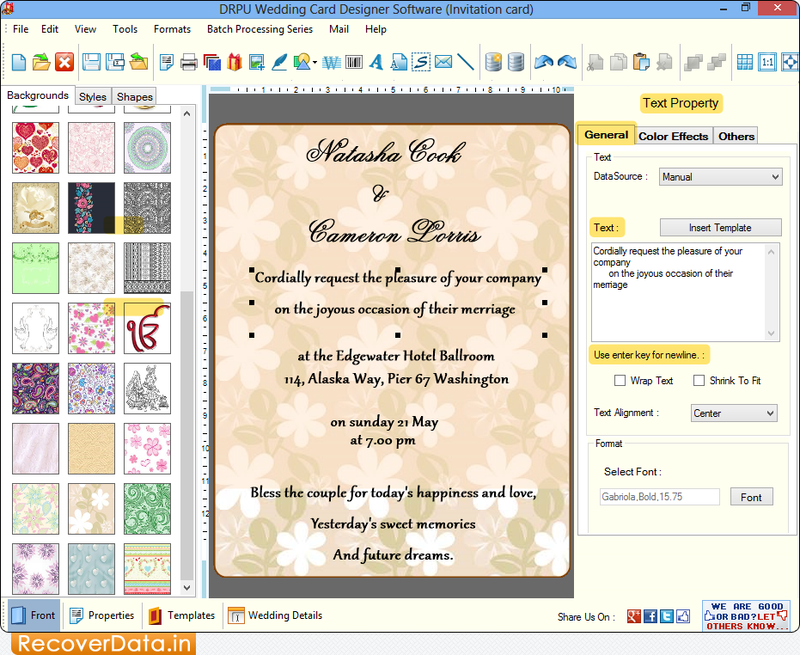 Software empower users to design wedding cards in rectangle, ellipse, rounded rectangle or any other shapes. Provides facility to use inbuilt template, add photos, set color and brightness to design attractive wedding cards. Wedding Card Maker tool facilitates users to send designed wedding cards at specific email address using email settings.